7-Eleven welcomes the colder months with new, limited-time Oreo Mint Hot Chocolate and will also be carrying a number of Oreo Mint products for a limited time. Oreo Mint is the second best-selling Oreo cookie flavor (behind original Oreos) and also happens to fit a winter theme. The new, exclusive drink can be found in the hot drinks section at participating 7-Eleven stores. The offer marks the second time that 7-Eleven has had Oreo-flavored hot chocolate on tap. Back in 2015, they served up the first-ever Original Oreo hot chocolate., which was their best-selling limited time offer for that year. 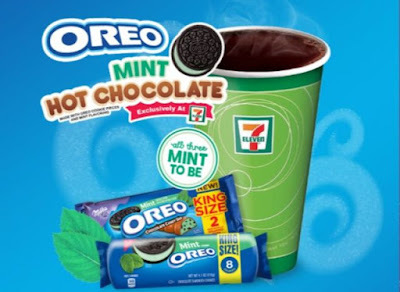 In addition to the new Oreo-themed drink, the chain is also offering single-serve size Oreo Mint cookies, new Milka Oreo Mint chocolate candy bars, and an Oreo-themed donut (a chocolate cake donut made with Oreo cookie pieces, topped with vanilla creme icing and Oreo cookie crumbles.